Under age 12 admitted free at both festivals when accompanied by an adult. Email Molly Hebert-Wilson to register for the band once you have festival tickets. What is The Great Groove Band? Donna Hébert developed this landmark performance program with Andy Spence at the Old Songs Festival of Music and Dance in 1998. 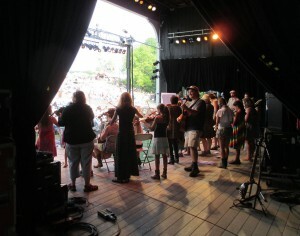 Thanks to Mary Lou Troy and Fred Kaiser, the Philadelphia Folk Festival imported the program in 2006, where it has grown its own distinct personality. 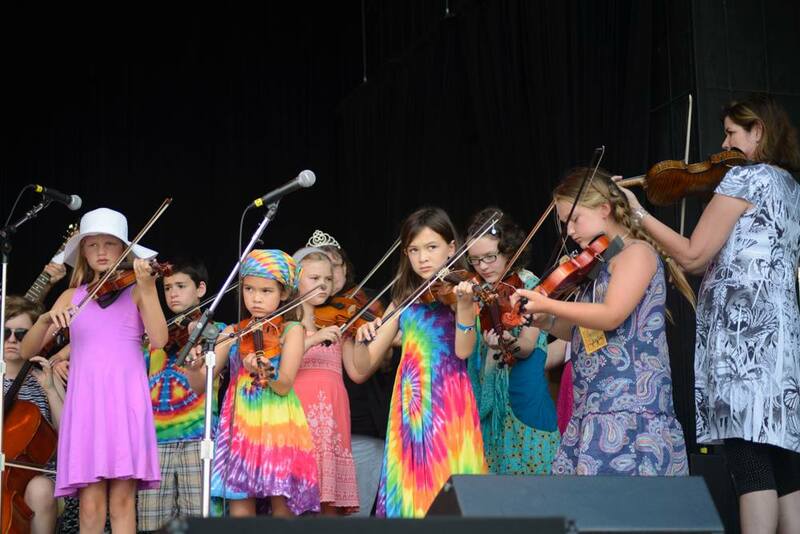 School-age musicians (ages 6-17) bring acoustic instruments and voices to both festivals. In six hours of focused rehearsal over three days, they experience the joy of music – learning, arranging, and performing fiddle tunes and folk songs by ear. Working cooperatively as a band, they prepare three numbers for a Sunday afternoon performance on the main stage. The band’s transformation from chaos to harmony is both remarkable and predictable, proving that music truly is our birthright! “One of the most emotional moments in the 50th Annual Philadelphia Folk Festival for me came when a crowd sang along to the only real national anthem this country ever deserved, Woody Guthrie’s “This Land Is Your Land,” performed by a group of children whose parents were longtime festival goers.” John Swenson: Music on My Mind, 8/24/11. Who plays in the Great Groove Band? 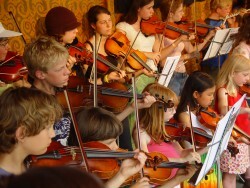 Singers and players aged six to seventeen are welcome, with or without an instrument. The group averages 40 participants at each festival and many members come back for years, often with friends in tow. ALL acoustic instruments (and we mean all – voice to violin to xylophone, harp to horn) are welcome. All levels are welcome. Every single child, regardless of skill level, has a part to play. Even if it’s the simplest part, we’ll help them find it! Sight-reading music is optional. We post the year’s program online in the spring. This includes audio files for ear-learners, with song lyrics and music notation for strings and horns. But even if you miss these, we teach everything at the festival, so don’t let that stop you from joining the band. We don’t use sheet music on the performance stage, though the rhythm section sometimes tapes their chord charts on the floor like the pros. We want them to be a band, have eye contact, communicate with each other and the audience. This is not a recital. Teachers play with them onstage. We all played with our mentors as young people – that’s how we developed the traditional repertoire and styles that we teach. Molly and her singers at Philly 2014. 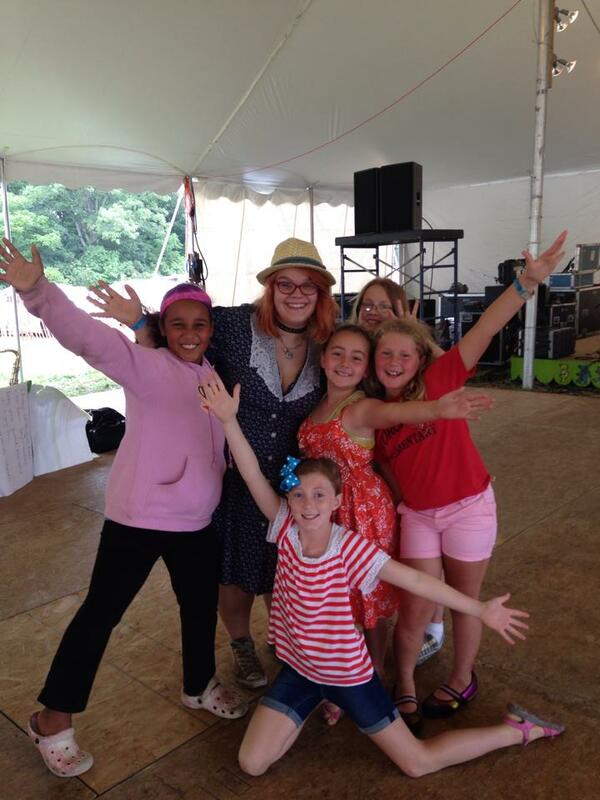 Contact Molly to discuss bringing our youth program to your festival. 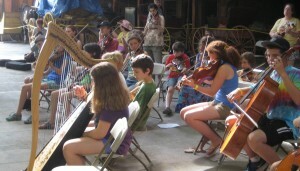 Teachers are also members of contradance and Celtic concert band Mist Covered Mountains. In 2018, fiddler and longtime volunteer Autumn Rose Lester and North Country fiddler Gretchen Koehler join the Old Songs teaching staff. Multi-instrumentalist George Wilson joins us at Philly Folk Fest. We couldn’t do it without our skilled volunteers, including school music teacher Brian Weilland and others. Our crew transforms even the youngest from shy newbies to band members in three days! What music do we play together? The repertoire ranges from Amazing Grace to Norwegian waltzes to Irish jigs and Scottish marches and Old-Time reels and folk songs from around the world. Each group learns a new set of tunes, chords, rhythms and lyrics on the spot, by ear, sometimes in Irish or French or another language. One year we heard a girl tootling “The Lion Sleeps Tonight” on a recorder and turned that into one of our songs, with vocal, lead, harmony and rhythm parts. It’s never the same program and it’s always FUN!